It’s not impossible — you really can get up and get moving in the morning. 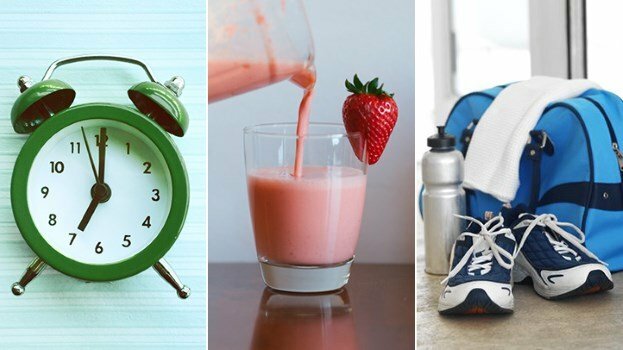 Move your alarm clock, sip on an energizing smoothie, and prep the night before to motivate yourself for a morning workout. We know, not everyone is a morning person. (And even fewer of us are eager to wake up and hit the gym.) But getting up and moving can actually be an amazing way to start your day. Sure, you may have heard the usual tips and tricks, but what hacks do people who consistently work out in the early a.m. actually use? We asked those who know best — a mix of people who train for a living, Greatist staffers, and you, our dear readers — to find out what gets them up and at ‘em at the crack of dawn. 3. Pack accordingly and get in bed early. 5. Have a delicious breakfast ready and waiting. 6. Keep the alarm away from your bed. 8. Prep your clothes — and a playlist. 9. Wear red and grab a mint. 14. Think about how you’ll feel afterward.